On this day in 1895, Wilhelm Conrad Röntgen discovered the X-ray. He was a physics professor in Germany, and had been working with cathode rays. His experiments involved discharging streams of electrons through various vacuum tube apparatuses. In one of these experiments, cathode rays were allowed to exit the vacuum tube through a thin aluminum window. He covered the aluminum with black cardboard to shield the fluorescent glow, yet he still noticed the beams escaping onto a barium platinocyanide detector plate several feet away. Figuring he had discovered a new form of radiation that could penetrate opaque objects, he called it “X,” the mathematical designation for the unknown. 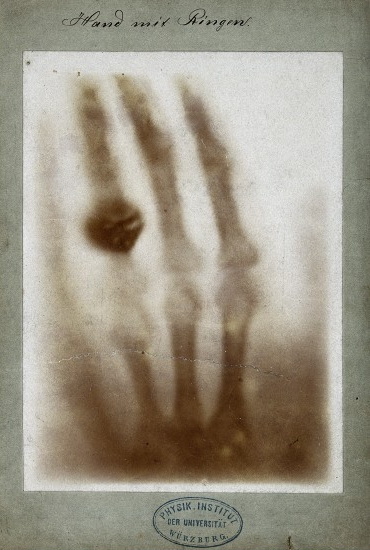 After various repetitions of the experiment with different tubes and metals, he went on to take the first clinical X-ray: a picture of his wife’s hand. The produced image was of her skeleton, as X-rays could pass through human tissue but not through bone. When she saw the picture, she exclaimed, “I have seen my death!” This turned out to be a prophetic statement, as she and most of the scientists who played with X-rays in the early days would eventually die of cancer. Röntgen initially continued his experiments in secret because he feared for his professional reputation if his observations were in error. He published his initial paper, “On a New Kind of Rays,” in December 1895, and by January 1896 the news of X-rays had swept the world. Soon commercial fluoroscopes came to common usage in such unlikely places as carnivals and shoe stores. At the same time, X-rays found their use in various clinical settings such as surgical operations and diagnosing bone fractures. Röntgen was awarded the first-ever Nobel Prize in Physics, and is recognized as the father of Radiology. Indeed, the whole medical specialty grew up surrounding his technology, now encompassing fluoroscopy, computed tomography, mammography, ultrasound, nuclear medicine, and magnetic resonance imaging.